Our weekends in Tokyo usually involved a fun outing at the zoo or museum. Or even just walking around somewhere interesting. Now that we're homeowners in America our leisure-time activities have changed a little. That's my husband with the sander he rented from Home Depot. I didn't mention to too many people that we were refinishing and staining the floors ourselves because the reaction from the first two people I told was discouraging. No one I know had ever tried it themselves though, so after reading several articles online, my husband felt confident that he could pull it off. He spent Saturday and Sunday from 7 am to 7 pm sanding and he still has some work to do in the corners and between the banisters. 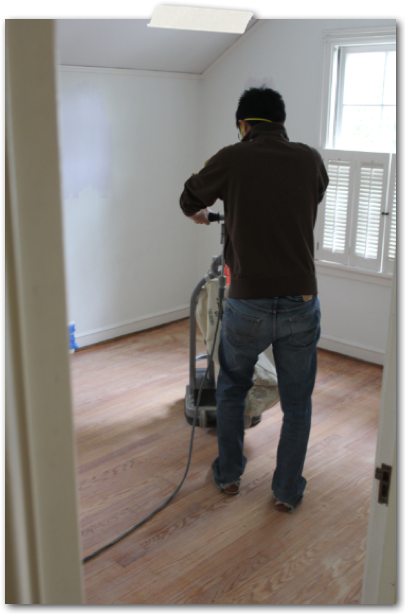 Then he has to apply the stain and polyurethane. Then we have to wait 3 days before we can walk on the floors. That's going to be the hardest part, although I'm sure my husband would disagree. I'm so ready to get our stuff into the house, but we've got to wait for the floors to cure. I'll post more on how the flooring job goes as it progresses. 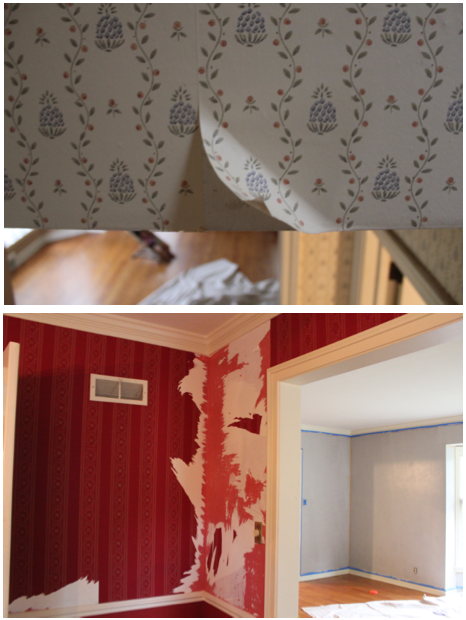 Here's where I attacked the really old wallpaper. I'm still trying to figure out the best method for stripping the walls, but the main problem is time. Like when will I find it? My husband and I have to take turns doing our work while the other watches the girls. And our #1 priority is finishing the floors. It's hard not being able to just get in there and get this job done. I'm so excited about seeing all the walls with fresh paint. Ideally, we would finish the walls first, then do the floors, but that's just not possible considering our schedules. 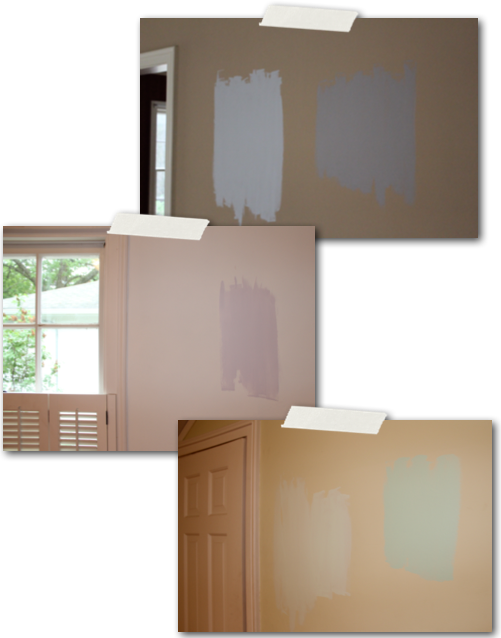 These are some paint samples I put up on the wall. That was the very first thing I did the day after closing. I thought we would go with the palest grey I could find for the downstairs walls, but it turned out looking silver, almost light blue. one other sample so she can have a choice. For the guest bedroom, I'm going with that darker green on the right. 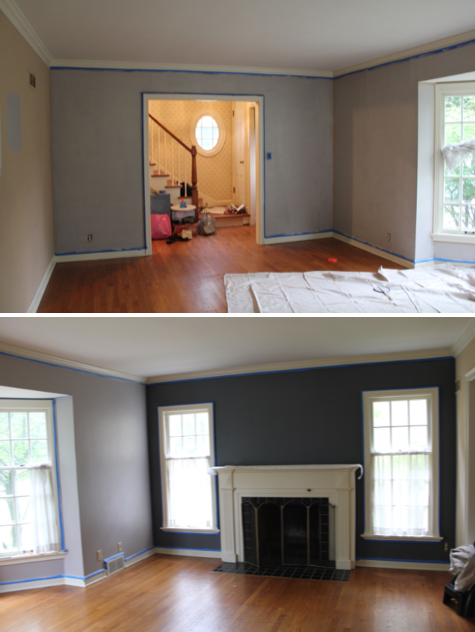 I did find the time to get 3 walls painted in the living room. I hadn't quite finished when I took these pictures though, so that's why they look a little, well, unfinished. Turns out the plumbing updates are a little more involved than we thought. The forth wall will have to wait until the plumbers rip it open to get to the pipes in the downstairs bathroom. Not a huge surprise there. I'm loving the greys. The dark grey is "Web Gray" from Sherman Williams. The lighter grey is something I had color matched from a sample I got at Menards. I can't seem to find the little sample card, though, which could be a minor setback because I need a few more gallons of it. Not sure why, but Sherman Williams paint didn't make it onto the best paints list in my Consumer Reports magazine. It went on really well and looks great. The price seemed a little expensive, but if you open an account with them you get special discounts. There was a 30% off sale for "preferred customers" when I bought my paint. The other pro is that they have a store right in town (within walking distance of my house). So that's our progress for week #1. Whether you worked hard or just took it easy, I hope your weekend went well. i know, that's funny huh? i was having trouble deciding, so i went with a name i'd remember.